My question here has been closed. Rename files 000…001…002… to 001…002…003 as too broad. From my point of view, it is clear what I am asking. I'm asking of a simple way for these files to be renamed, using anything in Windows or Linux. I am not asking for a script, I have spent countless hours on this site helping others with their issues. I am fully aware that this isn't a script writing service. Quite frankly I am sick and tired of the moderators and other users with their attitude. I was quite happy when the new rules and guidelines came in, but now I see there is no change. Indeed the aim of the site is to "Build a library of detailed answers", however the constant "This is off topic" is sickening, we are here to help people at the end of a day, and a simple comment is sometimes enough to point someone in the right direction, not just "this is off topic, go away". Without people we would not be able to build a library. The first question I asked, I was told that asking for software recommendations were off topic. Then thankfully another mod came through to explain how I just asked it in the wrong way. I was pretty unhappy with the site, but I forced myself to come back. I am on the verge of leaving again. I understand the off topic rules are in place for a reason, but I feel it very rude just to tell me that it's off topic, and close it or as a new user to be told, "Welcome to superuser.com! Your question has now been closed". We should be helping people to understand, not closing questions and telling people "You’re wrong, go away". As a new user, even though viewing both SuperUser and StackOverflow for many years, I just find this to be off-putting to join the community as a contributor and that any questions or answers I write are simply thrown away. It seems quite a difficult task to solve this problem. The first thing that comes to mind is to move them into another section, maybe something like 'starter', where the questions are discussed in more detail, with more help focused on getting the question right and if, and when suitable, moved to the main SuperUser. Just a suggestion. Maybe I'm just oversensitive but it almost makes me ashamed to call myself a member. Please take this post seriously, I'd like to be clear and state that I'm not just angry about the question being removed, but more with the attitude of the site. This applies to all users that have been here for a while. Your question here on SU Meta has two distinct parts, so I'll give you my take one by one. My question here has been closed. Rename files 000…001…002… to 001…002…003 as too broad. It is extremely clear what I am asking. I'm asking of a simple way for these files to be renamed, using anything in Windows or Linux. I believe your question is indeed potentially answerable. However, David Postill linked you to a similar question and how that's handled to give you an example of question standards. For example: you haven't specified what you tried with the bulk renamer, only that "it doesn't seem to like incrementing file extentions on Numbering (10)", which isn't terribly clear. We also don't know which bulk renamer you used. I suspect the reason that David has included that in a number of comments he puts on questions is that we get many, many such questions. It is not to imply that you are of the 'givemetehcodes!' mindset, but that many do. Saying you have access to Windows and Linux tells us that an answer from either might be acceptable; but not which of those you have used so far to try and solve the problem yourself. The clearer and more specific you are with what you have tried and where the problem arose, the better-received the question will be. This is more complex. Raising the issue on Meta (as you have done) is one way to deal with problems you perceive; you can also discuss issues of moderation in Ask a Super User moderator if you feel something does not hold up to the standards of the site. At 500 reputation, you gained access to review queues. Even if that isn't your thing, you can assist people by helping to make sure contributions - questions, answers, comments, moderation, meta! - meet the standards set by the community. vote to close or downvote is not a criticism of the person, but that the question is not a great fit in its present form. It is an opportunity to improve. Those nuances are sometimes lost. I agree that it is potentially daunting and off-putting for a user when this happens. Someone may put a lot of effort into a question, and that may simply not have translated well to how it fits here. secondly, many users do get assistance to bring their questions into line with standards; unfortunately, a decent proportion simply don't respond. The Roomba cleans up such questions after a while. Ultimately, if a question does not meet the site's standards, it behoves users to respond appropriately (by commenting/voting/etc) so that high quality questions can get high quality answers- in line with the mission statement*. My question here has been closed. Rename files 000…001…002… to 001…002…003 as too broad. It is extremely clear what I am asking. 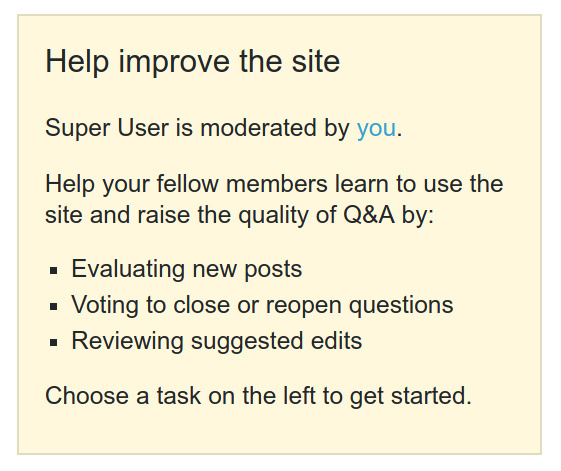 Your post on SuperUser is clearly a question that asks for either (1) software recommendations or (2) asks for someone to write a script for you. It is extremely clear what I am asking. Which is the ultimate reason why the question was closed: Your question is indeed too broad. You are incorrectly assuming “too broad” means you are not asking a specific enough question. You have asked a specific question. But any answer to your specific question will inherently be too broad because there are too many ways to approach the question. Regarding moderators being “rude” I hope you realize something: While one moderator shut down this question in particular, this community operates as a community and if this moderator did not do this on their own, the chances of other members of the community coming by and flagging the question to be closed—and even down voting—is quite high. FWIW, the quality of this site is based on solid, even-handed moderation. While I myself knows how it can sting to have a question slammed by the community, at the end of the day I realize I always have the option to delete my own question and even re-open and re-ask this at a later date if the need arises. As long as you take down votes and close votes personally, you will not be happy in this community. Take a step back and reflect on what might have happened and don’t take any of this personally. A “1 line linux command” is a script no matter how you cut it! And just because the code can be passed along in one line, does not mean it’s a simple task to create it! To create this one liner I had to look at some scripts I have, some Bash knowledge I have as well as some other answers to other questions online and synthesize a solution. This is not a “1 line linux command” but rather a “1 line custom script” and to dismiss this is not being a coding task is honestly patronizing. Again, I posted this answer out of goodwill based mainly on the perceived ills conveyed in this meta thread, but seriously discounting any scripting as being “simple” and saying it’s not a coding request is really callous. So I hope this solved your problem. But will state I do hope you really learn from this experience. I'll just focus on the "rudeness" part. If you ever go looking for a new doctor and read the reviews from patients, you'll find that a lot of the comments are about rudeness; the doctor was brusque, poor bedside manner, etc. For some people, pleasantness in a doctor is critical. But when you have a real problem, you realize that what is actually important is competence. You want to go to a doctor who will be best at fixing your problem. The best doctors tend to be in demand and busy, so they tend to be brusque. They also tend to have a stronger focus on the medical aspect than the interpersonal relationship with the patient. Super User isn't a tech support company, where answers are provided by employees who work in an office with a big sign that says, "Always remember, our customers are our most important product". Answers come from volunteers, most of whom are busy people. They fit helping people and moderating the site into their other demands. Yes, the Stack Exchange has a "be nice" policy. We try to have a welcoming environment and avoid overt nastiness. But at the end of the day, it's a collection of busy people trying to solve other people's problems and keep up the quality of the site. Part of the "job" is dealing with people who aren't good "customers". They come to the site not realizing that the objective is to build a knowledge base. Yes, they may get their question answered, but the actual goal is to add good questions and answers to the knowledge base to help all of the other people with a similar problem, it isn't to provide free personal consultation. That's a luxury we offer when we can. Such users often don't think about what role they need to play in getting an answer. To some visitors, fixing computer problems means having remote clairvoyant magicians divine what's wrong, and hand them a fix based on whatever trivial information is shared in a rant, posted with no effort on their part to do any preliminary research, or even type coherent sentences in the question, which is their price of admission. Of course not all questions are that bad, but a high percentage would at least benefit from improvement, and are part of a stream of questions that includes generous amounts of examples like that. It can be trying and frustrating, especially for people who want to contribute their limited time helping the most people they can. Add to that canned comments for common issues that tend to be short and to the point. It's an environment that we try to make an efficient process, but can sometimes seem less than friendly. The primary objective isn't to have a friendly forum at which to hangout and chat. People come to the site with a problem to solve, and come here because this is where they can get competent help. If people want a solution to their problem, to some extent, they need to deal with the environment that exists here. We periodically remind users to be nice, but the site is a collection of people. The people who volunteer their time to help with computer problems tend to share some personality traits that focus more on technical issues than people pleasing. The site doesn't have an "attitude". People with a certain personality and mindset gravitate here to provide support. If you want the best "doctors" to solve your problem, it may involve a little poor bedside manner. People who find that environment disinviting may feel more comfortable getting their problems solved in another venue. If they choose to go somewhere else, more power to them for finding an environment they find more conducive. I'm not saying we shouldn't always try our best to be nice, and we shouldn't just tell dissatisfied users to go screw themselves and find help somewhere else if they don't like it here. The environment here reflects the personalities of the users providing the help, and that's inherent in the experience. It's important for users to understand that and have realistic expectations. This applies not just to new visitors, but even some long-time members. Long-time members can notice the environment over time and think we can do better. They may even run into it with their own posts. Remember that we have mechanisms to deal with what may seem like adverse treatment of posts. Just keep that separate from your perception of the site experience, and keep the site experience in perspective. Not the answer you're looking for? Browse other questions tagged discussion closed-questions moderation rude . Where should questions which are directly related to SuperUser problems be placed? Is a question about computer output history really off topic or not constructive? Why was my question on RTF editing problems on linux closed? Can we make Raspberry Pi questions off-topic and avoid hurting Raspberry Pi.SE? Do you judge a question on the title or on the user's attempts to solve it? Correct way to handle users requesting scripts/formulae?